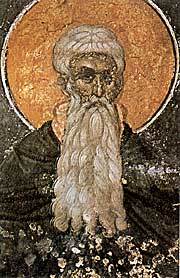 Abba Arsenius was a disciplined and learned man. In spite of all his worldly knowledge he could not escape the attack of the evil one. His only course was one of prayer. His prayer was sincere and unashamed. Through this prayer he asks for the profound “beginning of good”. The highest calling of all Christians is to ask for such. We have become too confident in our placement on the spiritual ladder to just ask to begin. All too many of us have lost the concept of sin. We must rediscover it to be ready to receive His coming.